Josh O'Brien, director of Portland's Oxford Street Shelter, counts mats on the floor at the facility Wednesday Dec. 12, 2012 during his daily walk through. O'Brien is receiving the city's Robert B. Ganley Public Service Award for his tireless efforts to help the homeless. 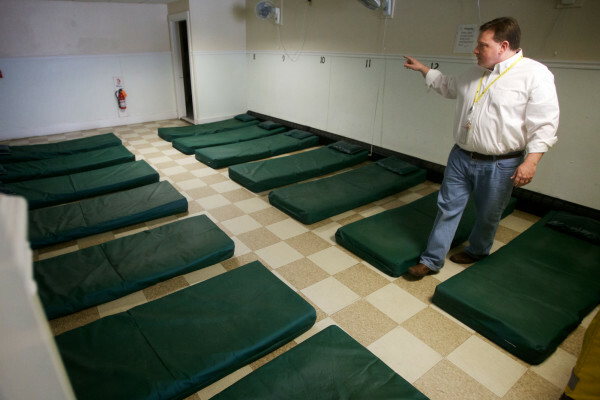 In two weeks, Portland city councilors will discuss a proposal to require housing developers who benefit from financial help through the city to set aside a portion of the units in their projects for people living in local shelters. The proposal would affect developers who use certain tax increment financing, city-administered Community Development Block Grants or federal Housing and Urban Development funds. There were a lot of comments decrying the plan. hophead3: Silliness. The potential value of the property will plummet and no developer will build, or they will build a cheap soon-to-be slum. Homeless shelters are not good for property values…shocker. TheWholeTruth: Sounds like a good way to attract more homeless people to the city. Good job Portland! Several attacked Portland’s City Council. It’s worth noting that the proposal comes from Mary Davis, director of the city’s Housing and Community Development division, and not from the City Council, which will take up the issue in two weeks. MKREDDY: I am flabbergasted. This is a quantum leap from being progressive to being looney. Is there a full moon in the council chambers? Others pointed out that developers could turn down public funding to avoid having to allocate apartments for the homeless. Flaneur: The developers should simply refuse the government welfare ( “city-administered Community Development Block Grants or federal Housing and Urban Development funds” ). Then they couldn’t be forced to set aside apartments for the homeless. maineiac123: Seems to me to be a very logical step, the developer gets our taxpayer money and in return he provides a few places for the homeless. Those places won’t be free, merely subsidized. One commenter brought up Utah’s Housing First program, which has nearly eliminated homelessness in that state. Portland homeless service providers, which have been promoting a housing-first model for years, have been recruited to discuss the approach at national conferences in the past. Perhaps getting enough housing available is the first step for both that program and for bringing down average housing costs across the board that may be driven by scarcity. There is a lot of screaming about “giveaways” and cost, but the programs that have worked have actually saved money for each state that they are implemented in. Some of those housed start to recover and contribute more to their own success. The people that want to punish the homeless and the mentally ill and disabled are all in opposition; but it makes no sense that they would be. If the objection is how much we pay as taxpayers, then any program that decreases that number should be acceptable.